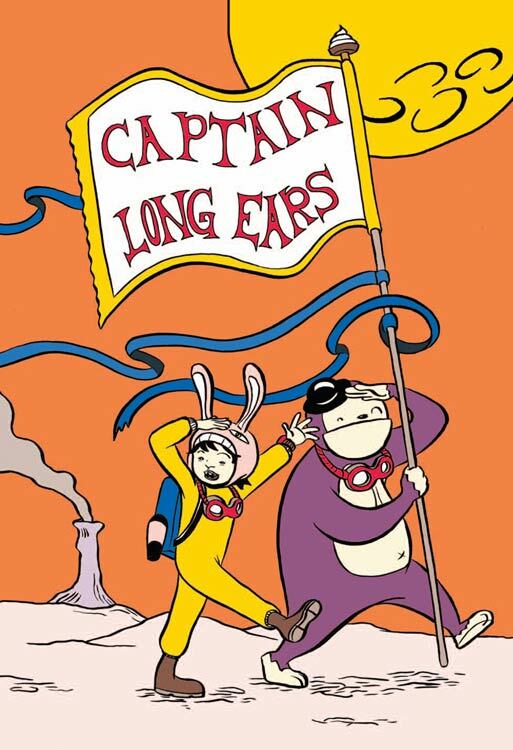 I added Diana Thung's debut graphic novel, Captain Long Ears, to my wishlist sometime last year but I have no idea why. Not that it sounded bad, but I honestly have no recollection of where I had heard of it or even what it was about. These are always cool to me when I do get around to reading them because I know I must have liked something I heard about it, but I can come to the book with no pre-conceived notions of what to expect. 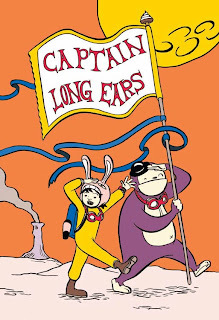 The short summary is that Captain Long Ears (eight-year-old Michael) is a Space Ninja along with Captain Jam (a stuffed gorilla). They spend a day and a night at the Space Ninja Headquarters (the Happy Land amusement park) and manage to save a baby elephant, all while on the perpetual search for Captain Big Nose (Michael's dad). The story is largely told through Michael's eyes, so authority figures become monsters and park rides become spaceships. Michael has plenty of adventures, though they're somewhat enlarged by his imagination, while his mother is on a desperate search for him before he gets hurt. The interaction between Michael and Jam, and everyone else they encounter is bound to recall Calvin & Hobbes; however, the similarity essentially ends there. Not only is Thung's art style markedly different than Bill Watterson's, but so are the themes being focused on. Where Watterson focused on a broad spectrum of adult "truths" but filtered through a child's eyes, Thung turns inward and shows the child's world in which adult issues aren't even recognized, much less understood. Thematically, in that sense, it bears more similarity to My Mommy Is in America and She Met Buffalo Bill. The distinction, though, is that in Mommy, Jean is only five, whereas Michael is eight here. In childhood development terms, that's a world of difference and the contrast between how the two characters react to similar news is interesting. Some of the adjectives used in the copy on the back of the book include: touching, goofy and endearing. I'm usually skeptical of copy like that on book covers, but it's definitely apt here.